•	Folio 68321F Folio 68183F •	Compact non-residential holding, situated at Ballinvoher, Caherlistrane, Co. Galway, situated on L2104 •	These lands are in good heart and are all in one Lot and are held under Folio 68183F and Folio 68321F Co. Galway. 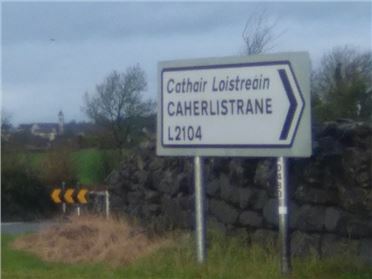 •	Situated on the Shrule/Caherlistrane Road – from Shrule/Headford side they are just past Kilmonagh Road – on L2104 – and coming from Tuam direction, turn right at Queally’s Licensed Premises on L2104 – proceed 4.5 Kms. – lands on right before Kilmonagh Road. •	Lands are very suitable for grazing or arable usages and have been well cared for and are in excellent heart. •	These lands have extensive road frontage. •	FULL DETAILS AND MAPS AVAILABLE FROM JOHN QUINN.